Bats have been abandoning their young as the mammals struggle to survive during a cold and wet summer. Calls to the Bat Conservation Trust's UK helpline about baby bats have more than doubled this year. The number of calls about grounded and injured bats over June and July - the trust's busiest period - also went up from just over 500 to more than 630. A shortage of insects has left adults battling to find enough food for themselves and their young. Anne Youngman, BCT's Scottish officer, said people who know they have bats roosting in their homes have been finding starving youngsters. She said: "People have been noticing babies which have been abandoned because there is not enough food. "Some have found five babies walking about the floor. It's heartbreaking. "The trust's helpline has been flooded with calls. This happened during a cold, wet summer four or five years ago, but it was not as bad as this year." Between June and July last year, the BCT helpline received 67 calls about baby bats. In the same period this year, the calls increased to 166. Mrs Youngman said this may only be the "tip of the iceberg" as other people may have contacted other wildlife organisations and as a result have not been recorded by the trust. She said: "For bats it's very bad news. "It means we have probably lost a good proportion of these year's young. The mothers only have one baby a year and must wait until next year to breed again. "The pregnancy birth and lactation make huge demands on the mothers, in terms of the time, energy and care that goes into bringing up a youngster so abandoning babies is a really desperate last measure." Ideally, bats need a warm spring followed by a summer without heavy rain and high winds and a steady cold winter so they remain in hibernation. Mrs Youngman said a recent scorching hot summer led to the young of one colony emerging onto a sticky felt roof where many of them became stuck and perished. The poor breeding season has also been noticed by Highland Council's countryside ranger service. 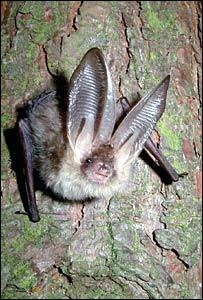 Its staff have been leading a series of walks where the public were given bat detectors to help spot the animals. Ranger John Orr said: "What we have heard across the country is that there seems to be less bats returning to summer roosts. "People who have bats in their homes and buildings have noticed the bats have not come back or are staying for only a short-time which means they are not raising young."